A selection of hydraulic hose fittings. Photo courtesy of Brennan Industries Inc. I woke suddenly in a cold sweat last night; I was dreaming about plumbing a transducer with a -04 SAE male thread into a teed assembly of 36-mm metric fittings attached to the pressure port of a directional valve … a nightmare in the best of situations. I’m not sure why the hydraulic universe has subjected itself to the insanity of multiple standards of fittings and adapters, but everyone will continue to experience night terrors until the world agrees on one design. I’m not optimistic. The reality is that there are numerous fitting, hose, tube, and adapter standards, and we simply must accept this reality by keeping stock of ridiculous quantities of adapters. If you visit any hydraulic distributor with a showroom at their order desk, you will notice the unfair monopoly fittings has upon the shelving real estate. 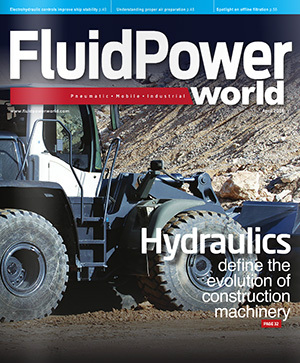 The problem, of course, isn’t just the standards expressing different thread and diameter dimensions, but that the manufacturers of the components of a hydraulic system can’t agree on one standard. If you’re not a seasoned hydraulic veteran, I can offer some advice for your selection and assembly of fittings and adapters. The first thing you should do is trash all your NPT-ported products. The tapered pipe thread had its fifteen minutes of fame, but the practical use of these fittings ia limited, and superior methods of joining components and plumbing exist. NPT is an all-metal connection which requires two tapered male and female parts to be jammed together as tightly as possible to seal, and even then, there is no guarantee it will seal a second time if components must be disassembled for repair. Cutting out at least one option, such as with NPT, is one way to reduce the adapter nightmare, and standardizing with an O-ring type fitting is the best option. Another technique to reduce the requirement for adapters is to use manifolds and headers. If you need to tee off a pressure port on a directional valve with a transducer, why not use a small piece of bar stock with ports drilled in? Manufacturers like Daman and Lynch offer such products, and they allow you to add a professional look to your plumbing while decreasing adapter use. Even a small block with metric ports at either end can have a small SAE port drilled and tapped into the top to accept the transducer directly. This option is especially beneficial to OEMs, where production planning reduces the requirement for fast lead times. So what if you don’t have eight weeks or more to plan around an adapter nightmare? This is when a bit of homework ahead of time will save both money and adapters in allowing two vastly different threads to connect. I recommend getting to know all your local fluid power distributors to see who tends to stock vast quantities of adapters. A -24 SAE male to 3/8-in. JIC male adapter exists, but not everyone carries it. Also, by limiting the type of fittings and connections you use on your machines, you can limit the requirement for silly adapters, such as the one required in the first paragraph. Limiting your machines to, say, SAE and JIC only may require that you replace every BSPP or metric fitting that arrives on your European machine, for example, and even if it cost a couple grand extra for machine installation, you will be thankful instead of having a breakdown that could be costing you thousands of dollars per hour while you try to find adapters for the repair—a nightmare indeed.